INFORMATION: Parallel cards for the American As Apple Pie In Your Face Series feature the same artwork of the standard white border characters with a subtle change (border color). 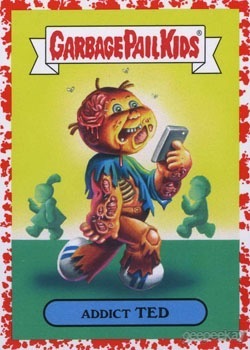 For this series Topps created a splotchy pattern and dubbed it 'spit' or 'blood'. This page is intended to serve as an overview of the parallels in the Series. Above are examples of the set/subsets...and below is detailed information about the parallels.